After observing the antics of the Grey Junglefowl, we ventured deeper into BR Hills Wildlife Sanctuary. After about ten minutes of driving, we spotted a sub-adult Elephant (above) grazing by the side of the road. 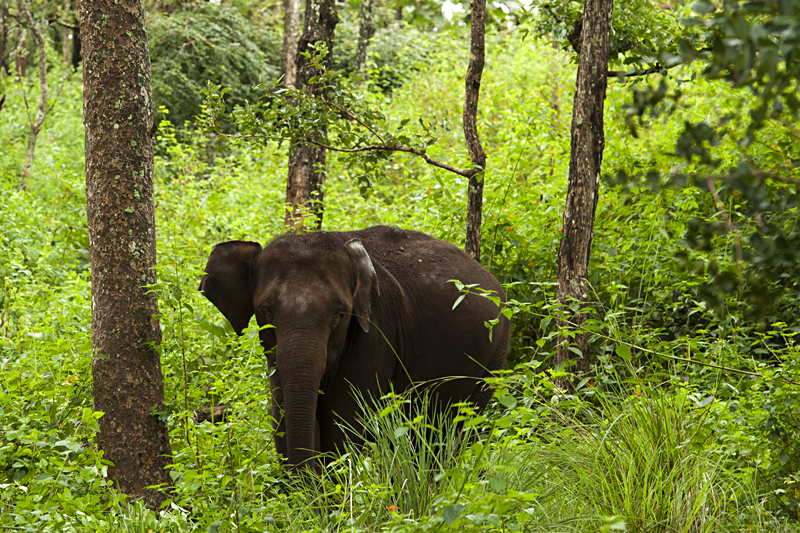 We had just stopped, switched off our engines to observe this Elephant when a furious female Elephant came charging at us with outspread ears and trumpeting violently. I swung my camera around and tried to focus on the charging Elephant, but did not manage good pictures because of the low light. 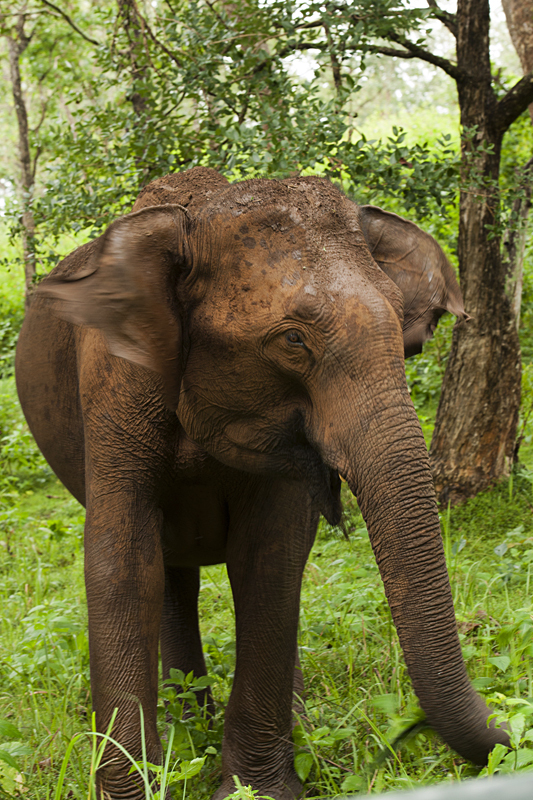 The Elephant (below) came so close to the vehicle that you could reach out of the vehicle and touch her. Finally she stopped just a few feet from the vehicle. We thanked our lucky stars that this turned out to be just a mock charge. 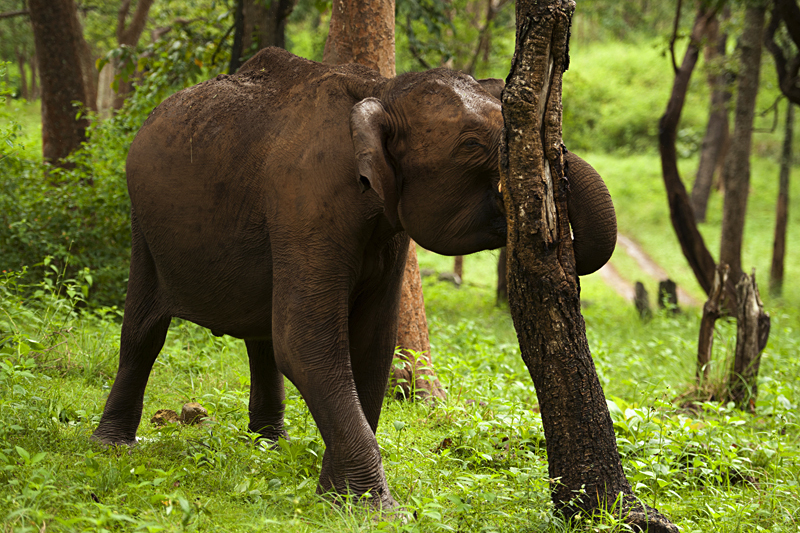 We were wondering as to what was the reason behind this female Elephant’s charge. 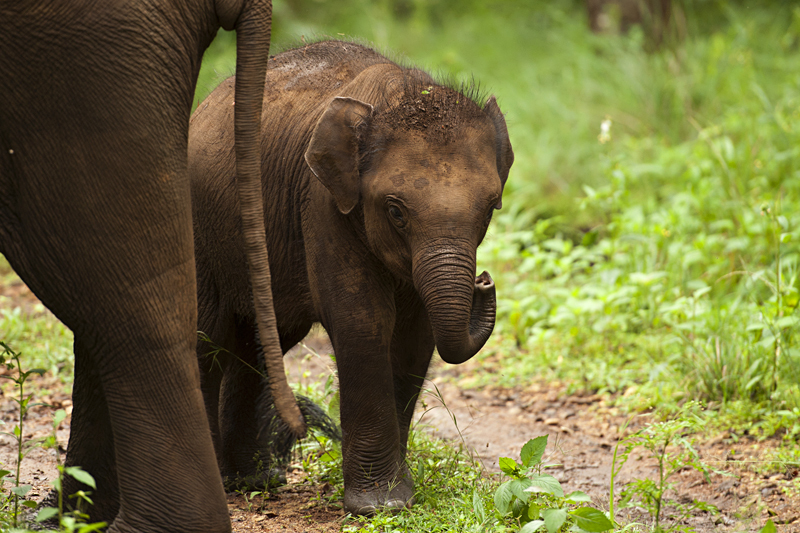 We didn’t have to wait long before a small calf (above) came out into the clearing. It joined its elder sibling and gave us a curious look. After a few anxious minutes, once the herd realized that we weren’t a threat to them, they settled down and went about their foraging. 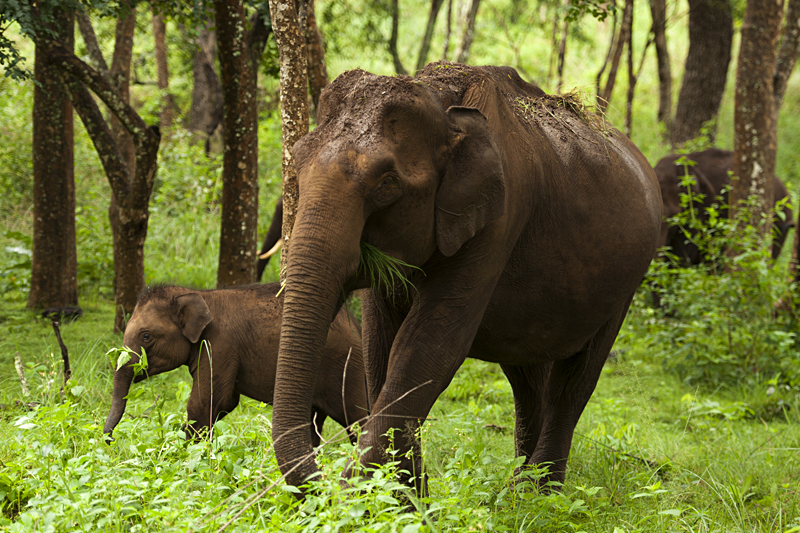 The Matriarch (below) of the herd emerged from the Lantana and escorted the young calf. The pair stopped at the middle of the road giving us unobstructed view of the calf (above) before coming back alongside our parked vehicle. The herd was now completely at ease with our presence. At one point we caught the whole herd in one frame and that is the feature image of this post (first image). At one point the Matriarch (below) rubbed herself against the trunk of a tree (next to the vehicle) giving us a glimpse of Elephant behavior. 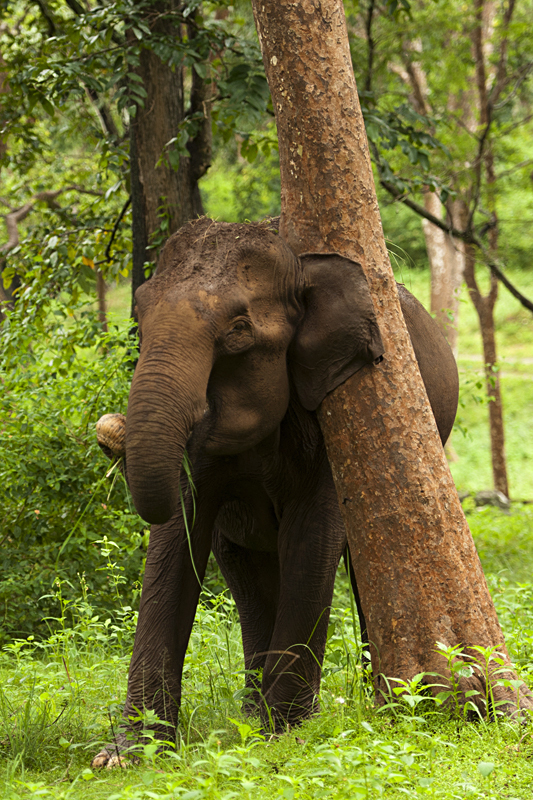 Soon, the young mother Elephant (above), the one that charged us, imitated the Matriarch behavior by rubbing herself against the same tree. 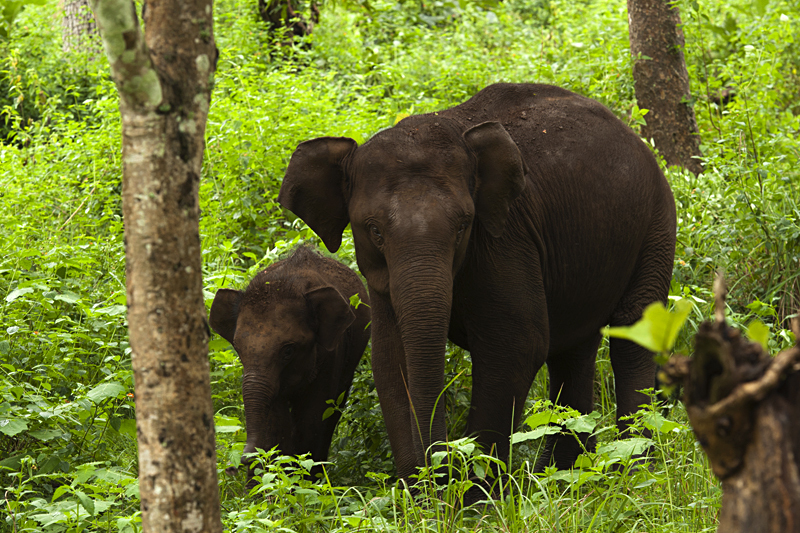 After a few minutes, the herd quietly disappeared into the Lantana and we happily headed back to the resort after witnessing this amazing Elephant sighting.